I am not sure of it... For those who believe in astrology, this year previsions for my sign weren't all that sparkling; nothing serious, just another year uphill. How was my 30th year of life? I think it was a good year, a positive one. I started this blog at the end of my 29th, I opened to the world my rambling in the kitchen and brought it to other people kitchens too. I was happy to be finally able to make other people smile and have a pleasant different evening (maybe also memorable). Opening to the world meant also starting to tweet. I met many great people, now great friends, thanks to this media. Food connects people at a higher level, faster, truer. 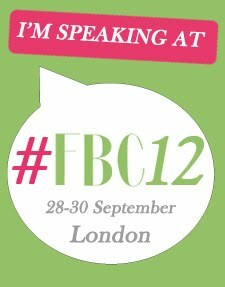 The first Food Blogger Connect conference confirmed this to an unexpected level. Opening the foodie door brought me in contact with an inner portion of myself, with roots that I was unaware to have, influences and dependencies that were so loudly screaming inside me to become quieter than a flying butterfly. Nothing is exclusively positive in our life, we won’t have white without black; I convinced myself of this when trying to reproduce a chiaroscuro as high-school task, I wasn't pushing hard enough my pencil and everything was flat. Thankfully we tend to forget most of our negative experiences so I can't really point out negative events; it is the overall lingering sensation of being on waiting for something to happen or to finish. Do you know when you feel yourself pushed to the border of the cliff? When the decision, a decision is building up in your head? Maybe this will be the year. In the meantime I am spending few weeks in Sicily with my family. I came down for Easter for an open ended stay so we could also have the chance to celebrate my birthday together. I am trying to open my family food horizon with my cooking and dining decisions so I opted for a dinner out in Catania. 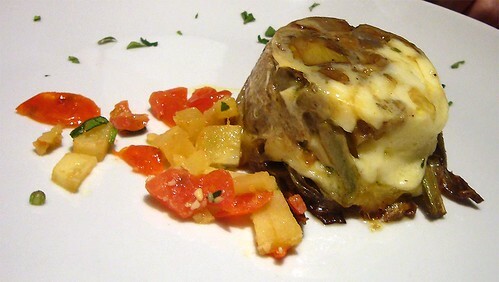 I asked my friend Alessandra to suggest us a proper restaurant to try; she proposed me the restaurant Metró in the old baroque quarters of Catania. 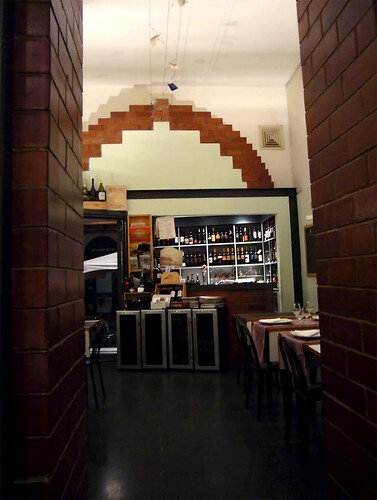 Via dei Crociferi, the street were the restaurant is, sits on the cliff of a hill in the southern part of the city, very close to the city Cathedral and the port. Steep streets climb its side starting from the main shopping street of the city, Via Etnea. 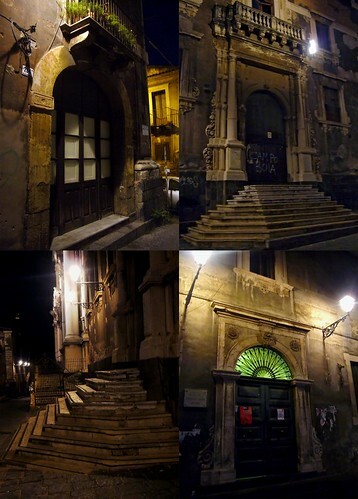 Walking through these streets, often climbing steps constructed to make the access to the higher part of the hill easier, you enter in the heart of the old baroque quarter of the city. The noble and religious buildings alternate in the same street with their majestic volumes delineated by lava stone and limestone bricks. The walls are high and dark; years of smog have left their imprint on them; as youngsters have with their graffiti. 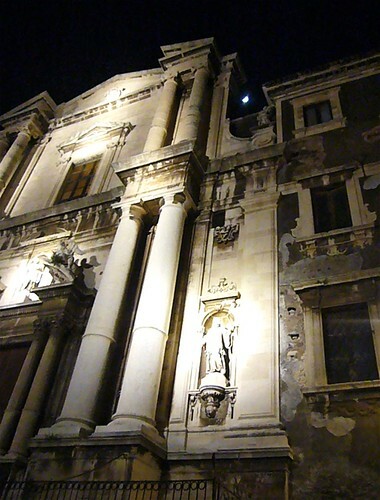 The candid facades of the church of St. Julian, St. Benedict and St. Francis Borgia appear like blades of light in the darkness of the night. Your thoughts go back to all the kids that were forced by their noble parents to take on vows and join monasteries just because they were the youngest. A gaze at the foot of the hill let you admire with contempt the frenetic errands of cars; radioactive particles underlining the city arteries. An old lady bringing her garbage out of the smoky dark house startles you, casting your sight over antique rituals of everyday life. A car honking wakes you up from the day-dream; time to proceed toward the restaurant. 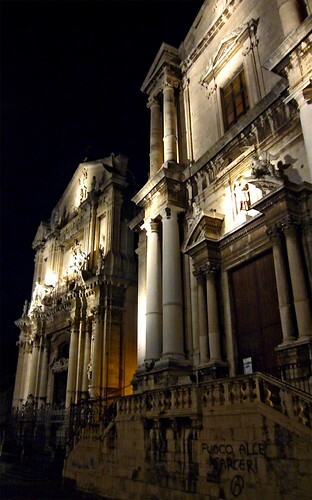 Unexpectedly on your right an open square, a new church rises staggering into the dark. Street lights give the air a yellowish glow; no harsh contours, histories melting together without scream. In front of you, at the end of the street, another architectonic jewel is protected behind a closed iron gate. 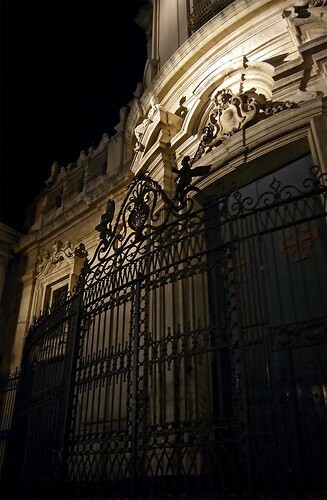 The luxurious vegetation of its garden is now merely lit by cold night lights; it is Villa Cerami now the law faculty building. Near it you discover the restaurant and surprisingly enough a Bed and Breakfast just in front of it in another three stories high building once belonging to some noble family. The restaurant has a nice terrace on the street (no cars can pass by). The interior appears like a long volume divided in two rooms, a narrow slit in the wall of the second one let you discover the existence of an extra third room. High ceilings, white and light green walls make the atmosphere light and elegant. Collapsing old wooden tables give the whole a rustic touch that contrasts with the elegant table set: a long lilac table cloth runs across the table, the immaculate dishes and linens reverberate the light coming from the spot light high above you; the crystals and cutlery play with the light like it was a tennis match. The menu is simple and straightforwardly printed, a little snail underline the dishes using local Slow Food presidia produces. 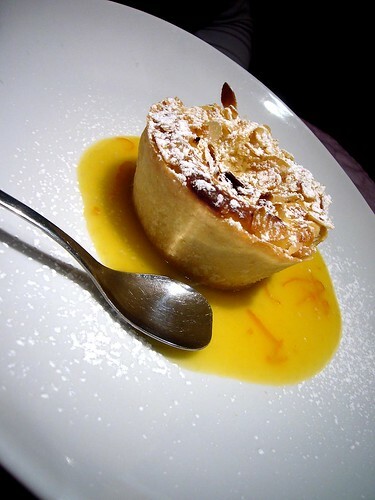 Both the staff and the owner are at your disposal to explain you the details of the dishes with courtesy and competence. The philosophy of this restaurant is quite clearly transmitted by the menu: local produces, traditional recipes with an extra zing. 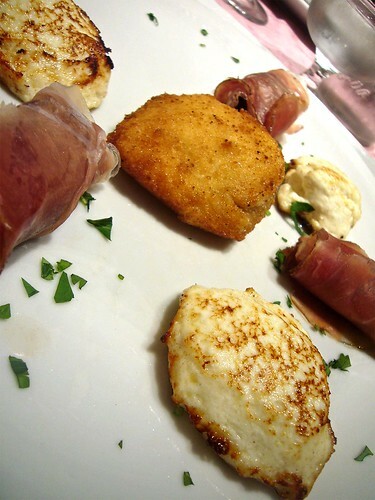 Crispy fried mozzarella cheese with "Masculina da magghia" fillet (fresh anchovy caught with a traditional method that produces a natural bleeding of the fish leaving the meat succulent and very delicate), griddled fresh sheep's ricotta quenelles and warm dried plums stuffed with pistachio nuts and rolled in speck. Cataneselle (shape of pasta similar to maccheroni) with vine leaves pesto. 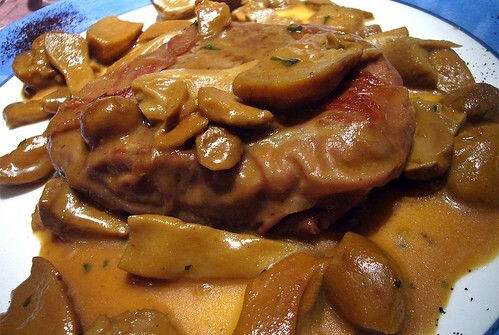 Beef fillet with Porcini mushrooms from the Etna and coffee powder. 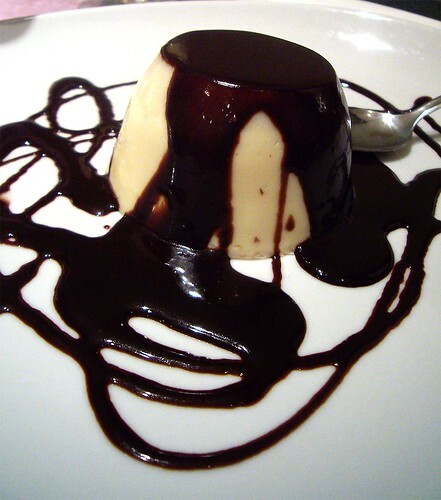 Almonds jelly with dark chocolate sauce. In total we had four appetizers, two pasta dishes, four meat courses and four desserts (We were in four after all). 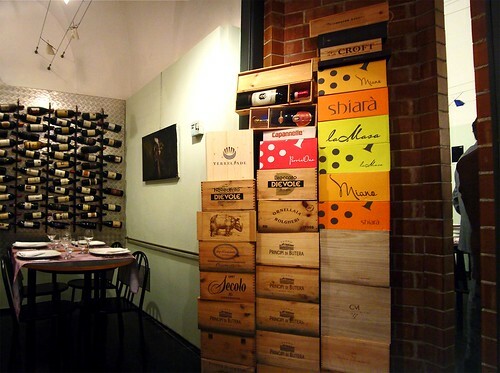 The restaurant Metró is actually also a wine bar, so you surely won't have any problem in finding a great wine to make company to your meal. 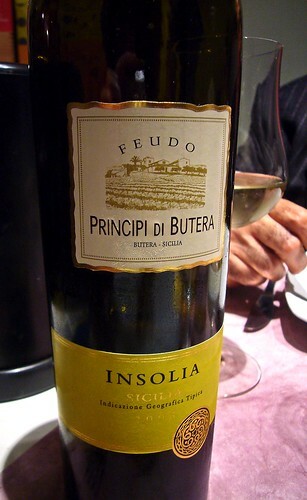 In our case, we wanted a structured wine to go with our varied meal and we chose an Insolia from the Feudo Principi di Butera winery. Characteristic for its sweet tones of almond and peaches and a pleasant crispiness, this complex wine can be the suited companion also for a more informal relaxed meeting aside a sandwich. 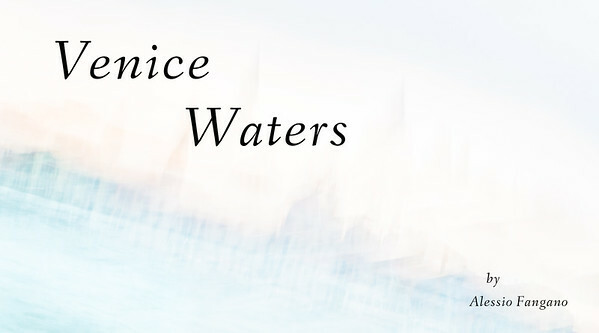 Its round alcoholic notes make the sip smoother and underline its body. When cold, its crispiness is what hits you more; standing on the glass you will discover the sweeter sides typical of the Insolia grapes. Then the food started arriving. Alternated with the baked dry plums stuffed with pistachio nuts and wrapped in fresh speck, the griddled ricotta quenelles were disposed in a rosette shape over a large white plate; at the center a crispy golden crust enveloped the slightly melted mozzarella patty. The ricotta quenelles had a nice mahogany marbling embellishing their warm and slight crispy surface. 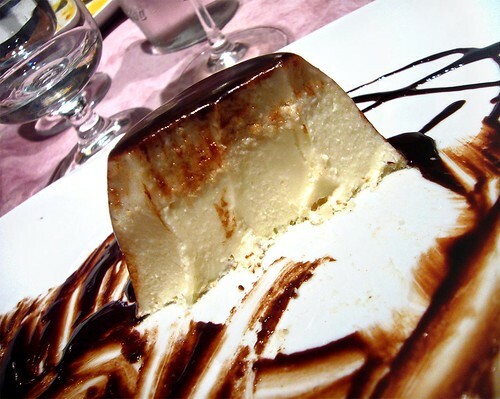 With a moist, fatty interior, the bite had the milky richness of the ricotta with a slight nuttiness coming from the caramelized surface. 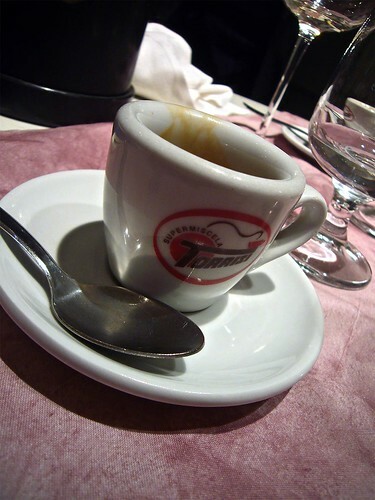 The light wild aroma typical of sheep's ricotta came as a delightful aftertaste. The plums were the cooling component of the dish. The raw speck provided a pleasant meatiness and a slight fattiness; its hint of smoke dialogged very well with the sweet dense richness of the dried plums. The pistachio nuts were evident only as a slight crunch. The fried mozzarella patty was crunchy and chewy. 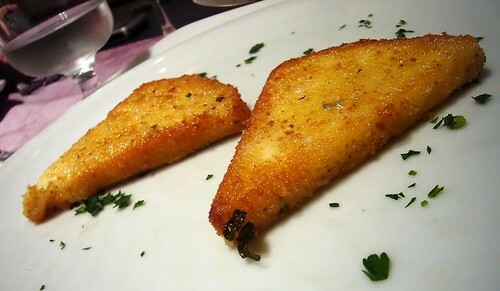 The breaded surface had the richness from the oil, its crispiness surrendering itself to the slightly rubbery interior. The flavor was nutty with the delicate tanginess typical of fresh cheeses. 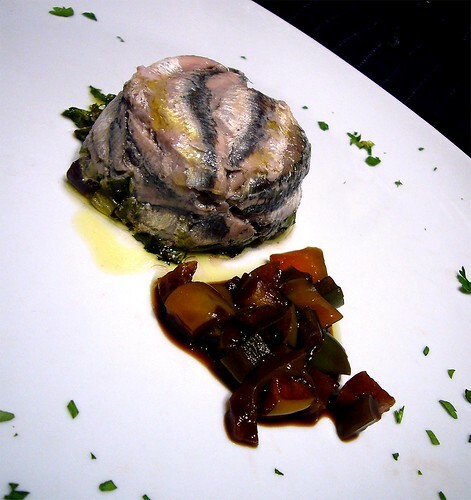 The bit of fresh anchovy fillet (Masculina da Magghia) in it enriched the sensation with a slight orangey aroma. There was also a half black olive inside that, eaten in the last bite, helped cleaning the palate with its fresh bitterness. When the pasta dish arrived, I was surprised by its enveloping heady vinegary aroma. The dish was green as a normal pesto but no hint of cheese or garlic to be seen a mile away. The pasta shape was a thin short maccheroni with a smooth surface. 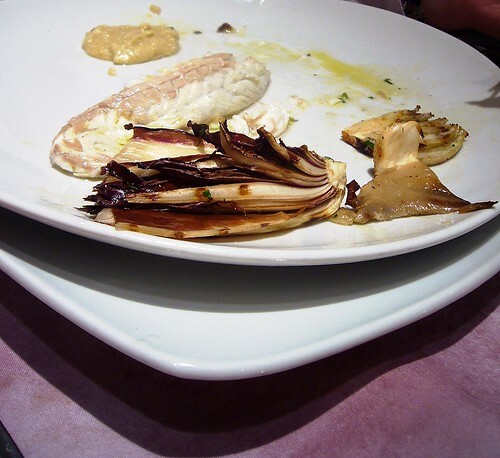 Particularly thick, it was perfectly cooked with a sublime resilience to the bite and a rich creamy texture. As the mouthful comes closer to you, the pungent aroma of white-wine vinegar reached your nose before anything else. 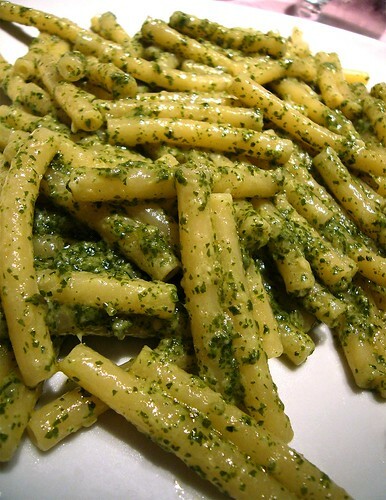 To the chew, the texture of the pasta came like a pleasant contrast to these sharp aromatic notes of the pesto. 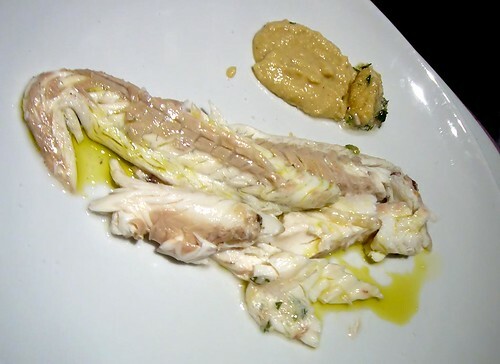 The sauce had a slight herbiness from the leaves; the milk soaked breadcrumb in it gave a sweet smooth aromatic backbone to the bite enriched by the fresh and shy aroma of the lemon zest. In its richness, a very light and addictive dish. 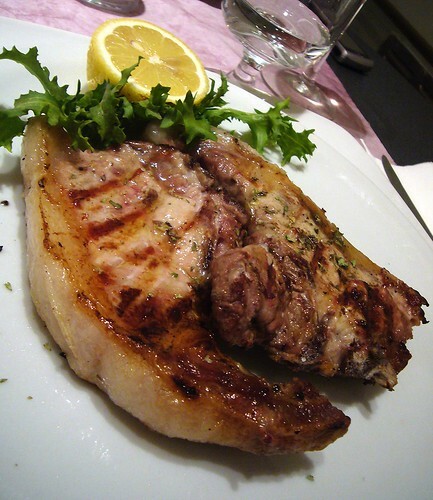 The meat course was announced by the nutty and alcoholic aromas of the Marsala wine. 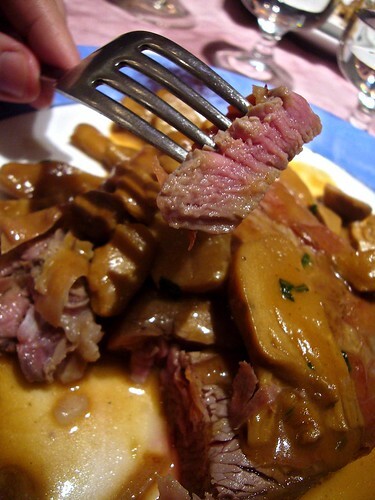 The fillet medallion was melt-in-mouth and velvety with a hint of smoke from the speck wrapping it. The porcini mushrooms had their typical crunchy and soft texture with a delicate earthy flavor. The reduction jus helped cleaning the bite thanks to its alcoholic notes. 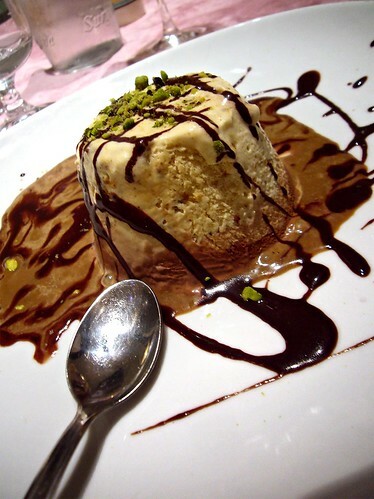 The Coffee powder was distributed in little mounds on the rim of the plate; upon dragging your bite across them, they provided luxurious richness, woody, comforting; still delicate. I would have liked to have it infused in the sauce or dusted over the fillet though; the act of dragging the bite on the rim seems to me a bit messy. The desserts were beautifully presented, simply but of effect. My parfaits trio was on the overall a bit too chocolaty. The praline parfait in it though was excellent; hazelnut in color, creamy and rich with a fresh aroma of hazelnut praline. The mocha sauce coupled with the parfaits was a bit too thin and sweet, considering also that the melting parfait was making it even sweeter. The almond jelly was very elegant and flavorful. 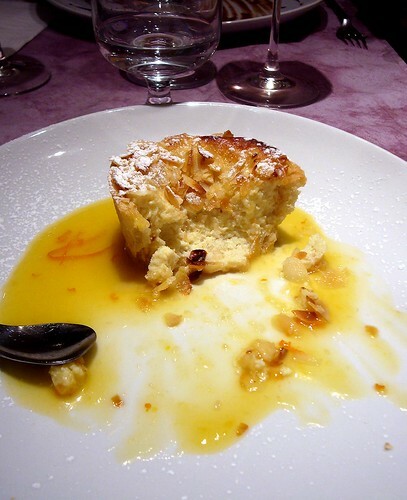 It had a nice springy bite with a delicate but assertive almond aroma; a slight nuts crumb on the bottom contrasted well with the smoothness of the jelly. 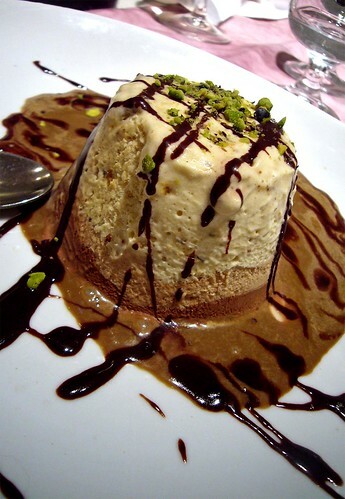 The astringency and slight acidity of the dark rich chocolate sauce cleansed the mouth for the next bite. The sheep's ricotta cheesecake consisted of a golden brown melt-in-mouth pate brise shell encasing a delicate warm ricotta filling. The shaved almonds on top, didn't give much to the dish but distracted a bit from the ricotta; probably if they were slightly more roasted would have been more of effect. The orange sauce was clean in taste and very aromatic, a bit too strong though often overshadowing the cake. The evening was memorable, the food was excellent and the atmosphere perfect; we swore to come back before I returned to Germany. Sounds like a wonderful birthday meal! Enjoy the rest of your time in Sicily, and Happy Birthday! Enjoy your vacation and may your future be full of all that you wish for. What an outstanding way to celebrate your birthday! Amazing photographs; and as always, spoken with elegance. Happy belated birthday and many many more!